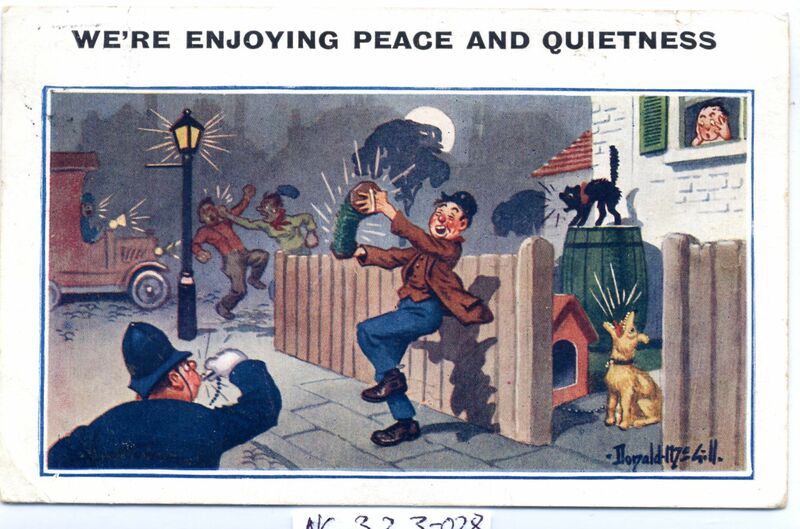 Full Description: A British colour-print Donald McGill comic post card of a raucous concertina player disturbing an entire neighbourhood, headed "We're enjoying peace and quietness!" The player has horrified a neighbour, set a dog howling, set a cat squealing, caused a copper to blow his whistle, and started two other neighbours fighting! Here is yet another example of the belittling of the concertina by its use as an item of fun. Divided rear, "Inter Art Co, Comique Series No 4386". Postally-used, sent from Broadstairs, 21st July 1924.